WASHINGTON — American policy-makers admit they have not worked to analyze the economic impact of the end of the North American Free Trade Agreement, even as President Donald Trump threatens to cancel the agreement. "We have not been asked to look at the [NAFTA] issue," said an official there. "[But] if we end up not having an agreement, my guess is all three countries will do just fine." Duncan Wood, a Mexico expert, said the U.S. is certainly acting like it wants to leave the pact, putting forward proposals the other countries could never accept. Wood said he fears the Trump administration is inching toward a pullout — without doing its homework. "That doesn't make me feel very good when I go to bed at night," he told panel this week at the Washington International Trade Association. "[But] that [absence of research] worries me." But he said broken cross-border supply chains aren't what worries him most. Wood expressed fear that the current fight at the NAFTA table is a prelude to a bigger battle against the World Trade Organization and international trading system: "These are dark days, my friends... This is near-apocalyptic what we're looking at. I don't mean to exaggerate. I'm not one for hyperbole. "I actually am terrified about what's about to happen." "Free trade helped make America into a global economic power," Bush said. "We see a fading confidence in the value of free markets and international trade — forgetting that conflict, instability, and poverty follow in the wake of protectionism." He said policy-makers should be sensitive to the painful effects globalization has had on some industries: "People are hurting. They are angry. And, they are frustrated. We must hear them and help them. But we can't wish globalization away, any more than we could wish away the agricultural revolution or the industrial revolution." The former head of Foreign Affairs' computer-modelling unit, Dan Ciuriak, said he's working on a paper on different scenarios for the C.D. Howe Institute. 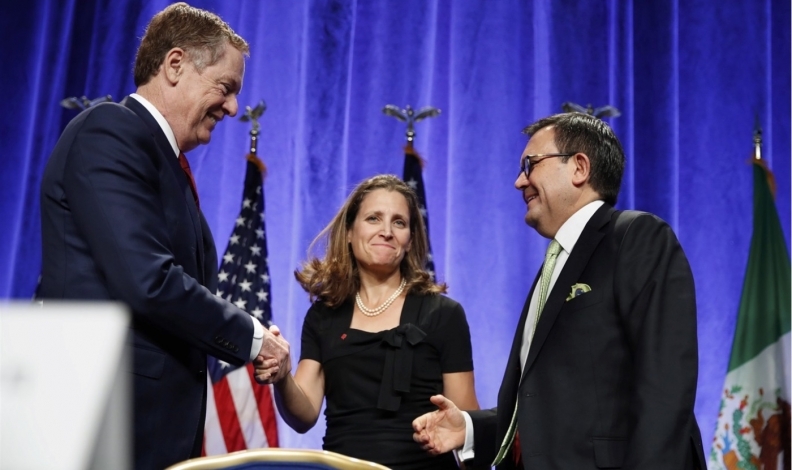 His preliminary estimate is that the most drastic result — the end of free trade in North America — would see Canada's economy contract 2.5 per cent long-term, with a larger shock in the short term.